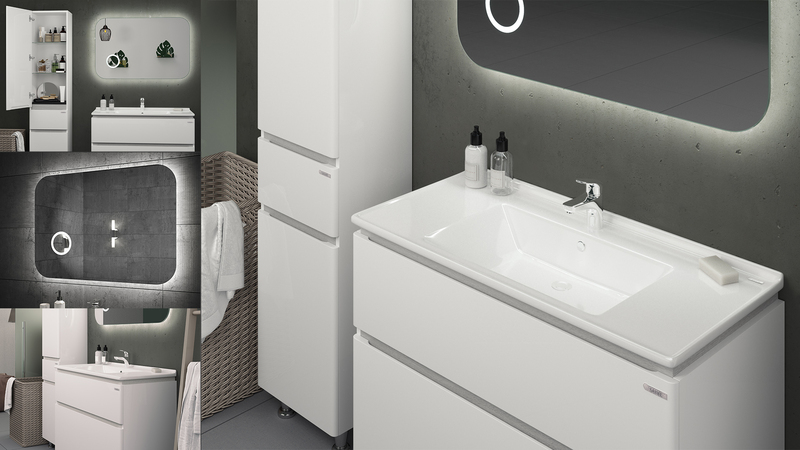 AMATA set of bathroom floor furniture and Oko LED Mirror. 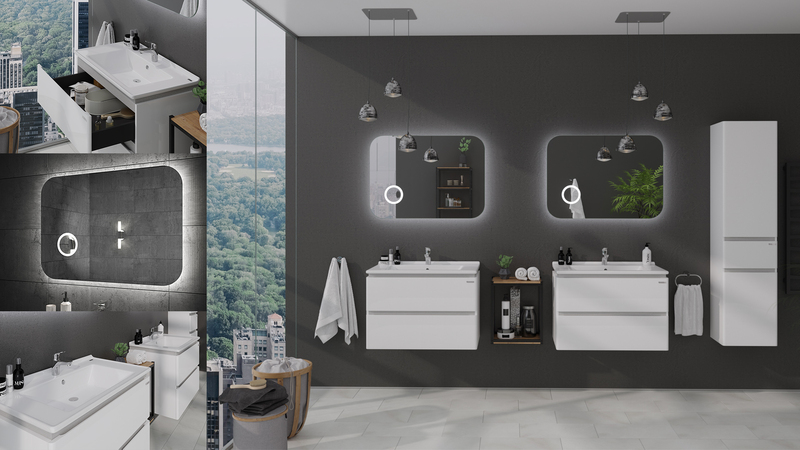 AMATA AIR set of bathroom wall hung furniture and Oko LED Mirror. AMATA Cabinets – Premium Style. The AMATA Сollection is the top of our products range. This is completely our ideas, our design, our development from zero level. 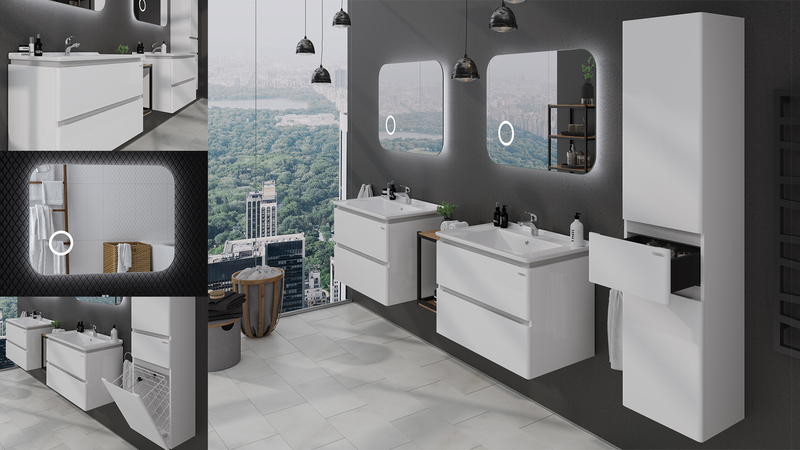 The AMATA Collection has several key differences: a first-class ceramic washbasin, internal space in drawer in dark gray (graphite) color, white railing, thick facades of 19mm MDF, MDF side panels, decorative insert film RENOLIT (Germany) with imitation of lacquered veneer. This collection is produced in handless style according to modern design, but with maximum comfort for the user. We produced the furniture fronts for a natural hand double-sided grip as both from above and from below. The elusive combination of straight lines of furniture fronts with radii and curvatures attracts people and makes them stop next to this furniture. 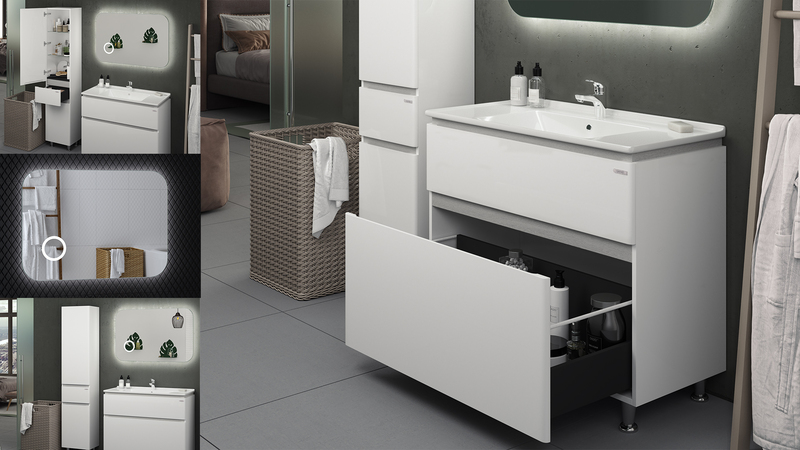 A thin washbasin fits perfectly into the overall style of the collection. The best fittings for the best furniture: brackets for wall hung furniture provided by Camar (Italy), concealed runner systems and hinges with soft closing Blum (Austria). The AMATA collection is one of our best offers to the market in complex of price, quality and design. Possible color solutions: white with light gray inserts. This wash basin stands out among the others thanks to its imposing and sophisticated look (it is 22 mm thick) as well as depth (460 mm). Width (under the wash basin): 600 mm, 800 mm, 1000 mm. Tall Cabinet width: 400 mm.